Review posted November 12, 2008. Walker & Company, New York, 2008. First published in Germany in 2007. 28 pages. Millie the bovine mail carrier stars in a new silly story, this time about Christmas. Originally written in Germany, I was delighted by the pictures, bringing back memories of German Christmases. Millie no longer ambushes the mail carrier. Now she assists him. At Christmastime, they are busier than ever. However, Millie has trouble finding her way home in the deep snow, and the packages lose their tags. Once again, the hilarity of this book is primarily contained in the amazingly expressive illustrations. As a bonus, along with the exuberantly illustrated main story, there are multiple antics taking place in the background. 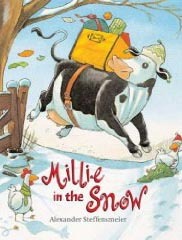 Millie is not your typical cow, and this is not your typical Christmas book.